Suggestions on buying or making a great Light box for tracing? Your thoughts are so appreciated. I have used windows and my acrylic table (for my sewing machine) with a light underneath. There are several ways you can make a light box. If you have a dining table that separates to insert leaves to make it bigger, pull the sides apart, place a piece of glass or plexiglass over the space and put a lamp underneath. This is good for larger designs. I have a square endtable that has a clear insert about 18"x18". I put a lamp underneath it. Or, take a clear plastic box and turn it upside down with a light inside it. With the new LED lights that don't generate heat, this is nice, because you can use a thin plastic box. I purchased one of the opaque white project boxes that are 13x13x2 from JoAnn's to make a traveling light box. I have all my marking tools, masking tape and the LED lights that are battery operated in it. Check out Harbor Freight for LED lights. I just bought several for $1.99 each that are 12-bulb lights and used AAA batteries. Wow great information - using a clear plastic box and LED Lights. Thanks for sharing this!!! The portable idea is great! Bellaboo posted this last year and I ran to Walmart toy department to get mine. Unless you need a big light box, this has a surface about 8x11 and I LOVE it. I use it for tracing Redwork patterns onto muslin. I have a design on white paper in sharpie with a thick piece of muslin on top and I think you can see how great it works. For $25 in Canada, it works perfect! Walmart here was sold out of every one after my show and tell at guild meeting showing mine. LOL. It's lightweight, no cords, and the LED lights are super bright. It's made for kids so it is sturdy. It was $20. Some posters found them on clearance for $10. I have old hobnail lamps with glass shades in my bedroom. For smallish designs, I just slap a 16 inch square up ruler on top of a lamp and start tracing. I have a glass top coffee table. I just put a lamp under the glass and presto, a light box. What is the toy? I love this idea. 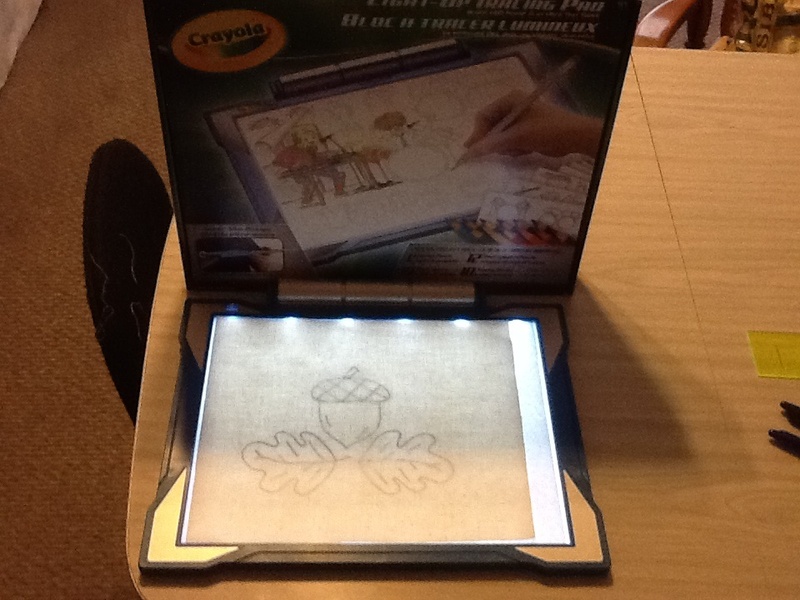 Mine is in a green box that says LIGHT-UP TRACING PAD it is made by Crayola. It comes in pink or blue and comes with different colouring sheets for children. Stores that sell Crayon products should have it. I use a window on top of a milk crate with an ott-light in the crate (the wire comes through one of the holes in the crate). The best one I ever had was a glass-top pedestal dining table! Perfect with my lamp on the floor under it. Look around at home. My first light box was made with books a torch and a large piece of thick plastic or a piece of glass on top. Moved to a coffee table and have a homemade one now. Due to a car injury the one place I can't use is a window. If you have a frame in the garden for growing seeds that also works. Think outside the box. I have a light-box that was used for viewing camera slides. I made mine using a large piece 18"x18" of Plexiglas which I sit on the table using 4 vegetable cans in the corners. Then I found a sting of white icicle Christmas lights at thrift store for $2.50. Put lights under the Plexiglas and presto you have a beautiful light box. I just got mine today. Which is funny because I don't do appliqué or anything where I would need it. But I just cannot resist a gadget or a gizmo! Thanks to this thread, I ran out to Walmart and got the Crayola one today for $20. I love that it's slim and portable, so I am able to take it to class with me. I also have the one I purchased at walmart, works really great! I used a9x13 glass Pyrex cake pan that came with a lid. I bought stick on led light at Walmart that is battery powered with remote. Stuck the light to the lid and then you put it lid side down and have a nice glass surface to trace on. This was before hubby told me" I have an old X-ray box that u can have. Love it cause it is huge.